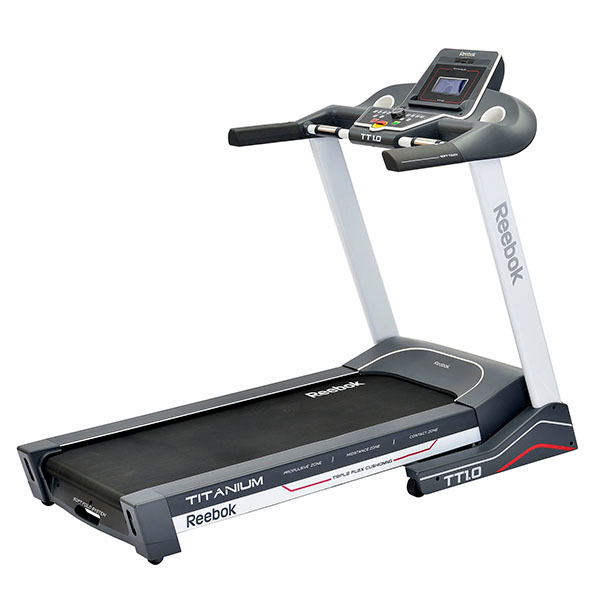 It’s been a while since we had the chance to check out a treadmill from Reebok so we jumped at the chance to take an in-depth look at the Reebok Titanium TT1.0. Reebok’s track record over the years has had some great highs and a few lows but mainly they’ve always offered good value and produced some pretty good kit. So how did the TT1.0 perform when we finally got our hands on it? In the assembly manual, Reebok have opted to do away with words and diagrams! Instead, they’ve gone for numbers (1, 2, 3, 4 and so on) and photos. This actually works really well, at least with this model. This approach, combined with the simple nature of the assembly means that building this treadmill is pretty much idiot proof. Really simple and took us about half an hour. We can’t see how you could make it any simpler without making it a pre-built model. While beauty is subjective, the TT1.0 really does look good. Its clean, white design and chunky looking body make it look modern and attractive. 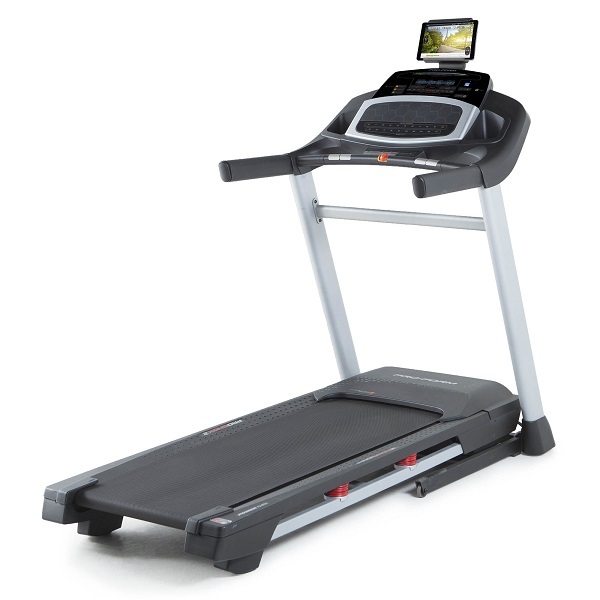 It’s a nice looking treadmill but it also looks like it’s built to take a load of abuse! Looking at the guts of the machine the TT1.0 is powered by a 2.5 HP continuous duty motor that drives the running belt up to a respectable 18kph (11.8mph) which will offer even the most hardened running enthusiast a serious challenge. Chunky rollers also mean that it’s nice and quiet, even at the upper end of the speed scale. 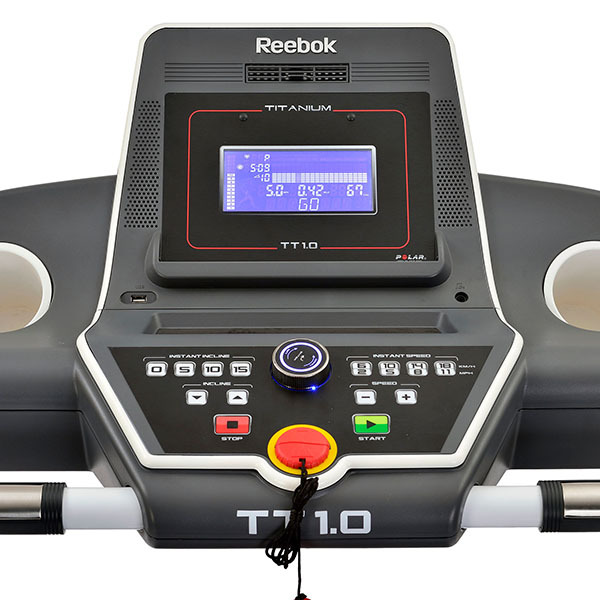 This is a superior model to the similarly named TT1.0S which has smaller rollers and lacks a heart rate receiver (basically a cheaper version of the TT1.0) and while 16 levels of electronic incline make it easy to find just the right level for a wide range of workout types. The 2.5hp motor really does make light work of driving the belt along and the feeling we got was that it just simply wasn’t trying. Always a good sign for long-term life expectancy. The switch between each incline levels and speed settings is quick enough to make the TT1.0 suitable for interval running and the deck is stiff enough to provide a good launch surface but soft enough so that you can instantly feel that it’s taking care of your joints. This is the result of their latest cushioning system named ‘Tripleflex’ which divides the deck broadly into 3 zones – ‘Contact’, ‘Midstance’, ‘Propulsive’. In plain English, this means that the deck is softer towards the front so that it absorbs more of the energy produced on impact, and gradually stiffens towards the rear of the deck so that the energy produced on launch propels you forward, rather than being absorbed. The theory is great but what really matters is how it feels in practice and the TT1.0 delivers a nice comfortable run. 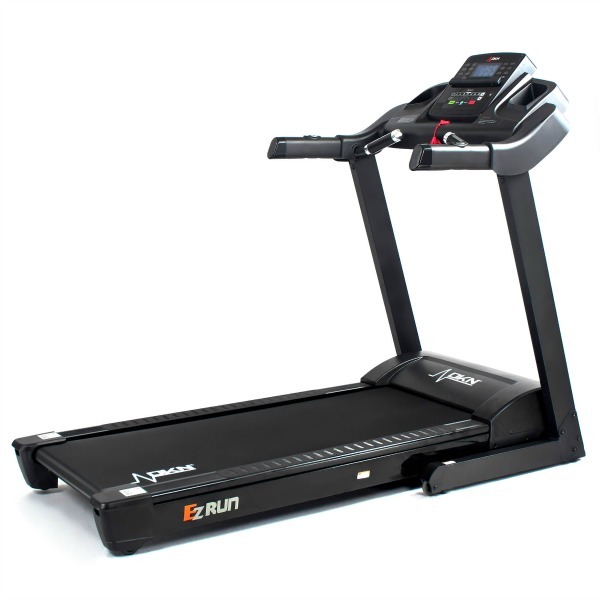 At 50cm (19.7”) x 140cm (55.1”) the running deck isn’t huge but it should be comfortable enough for all but the tallest of runners. With the TT series Reebok have introduced their ‘i-drive’ button which sits at the centre of most things you do on the console. There are the usual buttons you’d expect to find – start, stop, +/- for speed and incline and quick access keys and that’s it! Then there’s the i-drive button for all the rest of the functions. We found this to be a really nice feature as it allows very quick access to settings. Instead of having to repeatedly push +/- keys you just turn the dial to reach the setting you want and then press the dial to select it. Very quick and easy. The 6 preset workouts include walking, hill climb, hill run, interval, rolling and weight loss and all can be manually adjusted offering a high degree of flexibility, allowing the time, incline and speed to be easily adjusted, extending the useful life of each workout to pretty much infinity! Another feature of the console we really liked the idea of is the Random programme. There are four levels of random to choose from – basic, normal, advanced and high intensity. As the name suggests you just select the level of difficulty and the treadmill delivers a random workout. 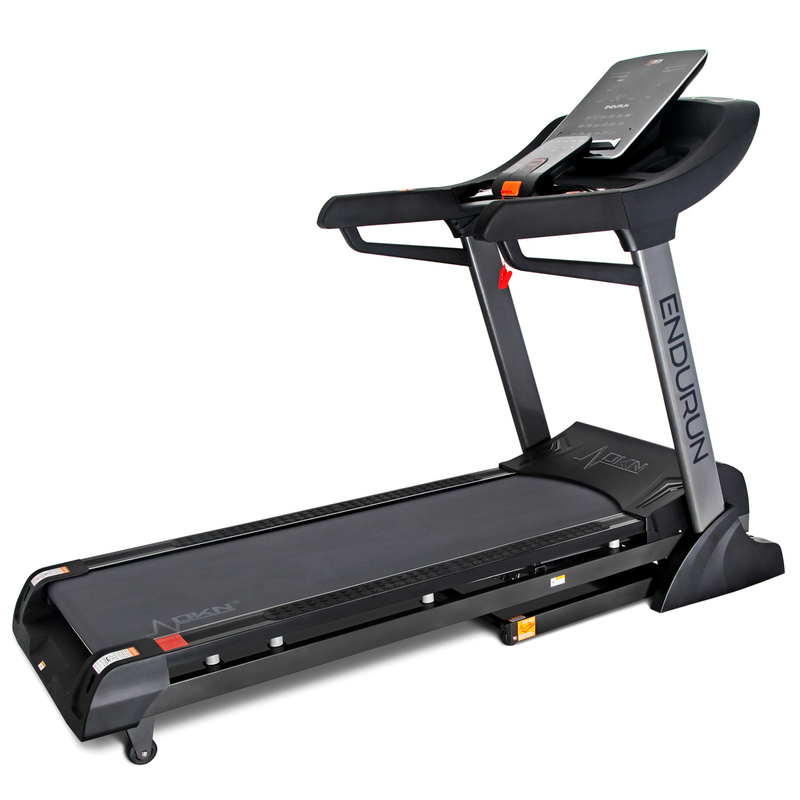 This feature keeps things fresh and interesting which is important as treadmill running can get tedious quite easily. In addition to the presets the console offers you the chance to create 4 programmes of your own which are then saved for use later. 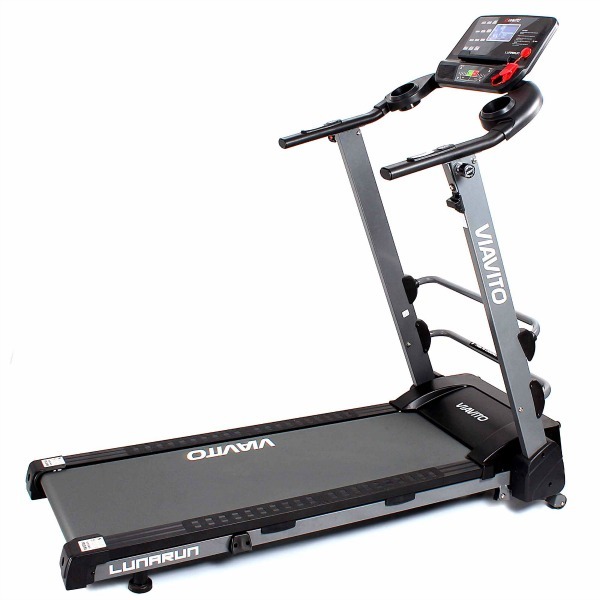 Creating the programmes is made easier than on most other treadmills as it’s done largely via the i-drive wheel. 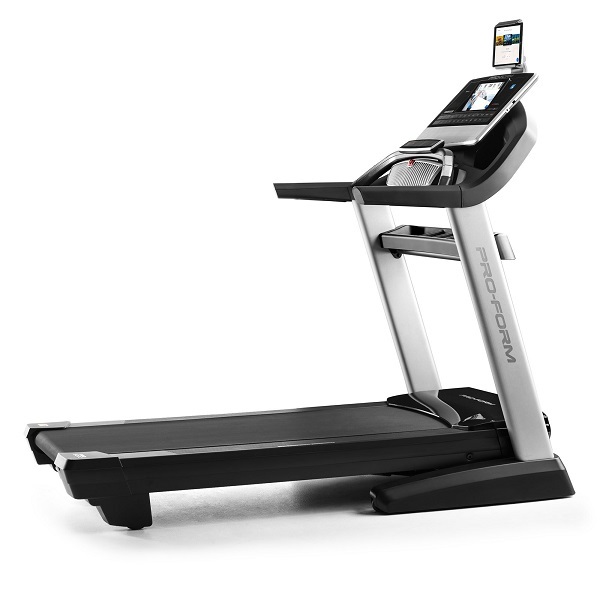 Most treadmills offer you 1 or 2 user defined programmes but to have 4 is something we’ve not seen before. Though in reality whether you really need this many is a big, big question. Looks great on paper though. Heart rate training is available in the form of zones or target rates while there’s also a body fat indicator function and 5 user profiles which once set up increase the accuracy of the data. There’s also a USB port built in which you can use to charge your tablet/phone, though it doesn’t connect to your device in any way. In short, the console on the TT1.0 has a LOT of functions and programmes to offer. Full marks for effort on this front. 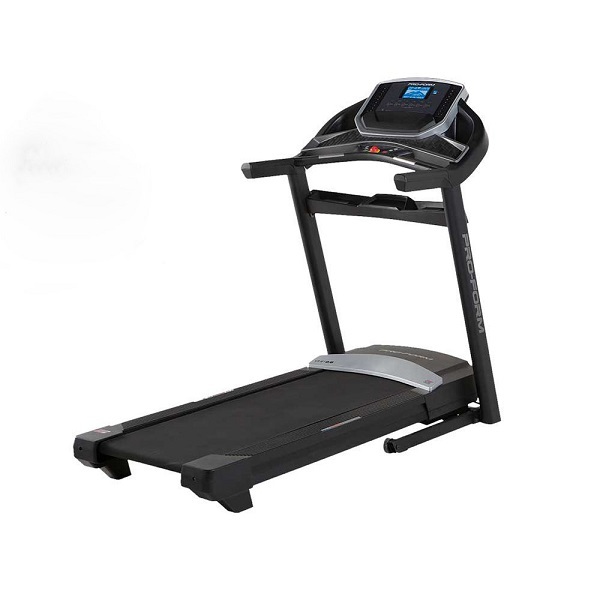 The blue, back lit LCD display is nice and clear and provides all the usual feedback you’d expect to see including calories, speed, incline and so on. We found it was clear even in the bright environment of the office. The only complaint here is that the screen could be bigger. With a 2 year on-site parts and labour warranty, a host of functions and training options, the introduction of the i-drive wheel and an advanced cushioning system the Reebok TT1.0 is certainly worth considering. 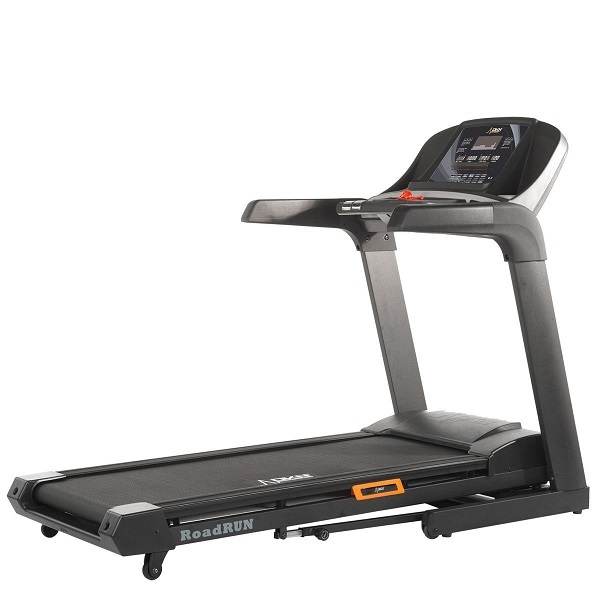 The Reebok TT1.0 is a well thought through treadmill that has a lot of programme options and a good cushioning system- it's all we'd expect from a Reebok machine. The issue with the TT1.0 is the value for money side of things. You can get a similar spec machine with the Proform 545i for a much lower price, or the rather nice DKN AiRun Z for similar money!